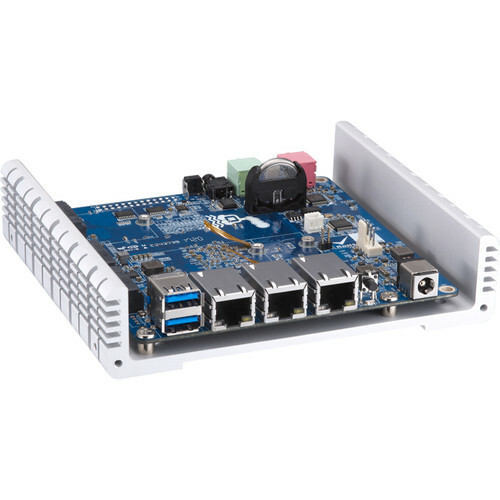 The QBoat Sunny from QNAP is a dedicated, single-board Internet of Things (IoT) mini server for IoT developers and provides high expandability for connecting many IoT devices. Thanks to Container Station and QIoT Suite Lite, the QBoat Sunny allows you to manage and monitor your IoT applications, devices, and data for a streamlined and efficient IoT development experience. For those who are working with IoT, the QBoat Sunny is a bridge to your IoT devices and applications, and also acts as a private and/or public server/gateway. QNAP built the QBoat Sunny with dual M.2 SATA SSD slots, each of which support 2260 or 2280 form factors. It is driven by a 1.7 GHz Annapurna Labs AL-314 Quad-Core processor, 2GB of DDR3L RAM, and 512MB of NAND flash memory. For connectivity, it has three Gigabit Ethernet ports, two USB 3.1 Gen 1 Type-A ports, and an M.2 2230 slot for adding Wi-Fi. The QBoat Sunny is a single-board IoT mini server by QNAP. Measuring only 4.7 x 4.7" (without heatsink), the development board-like design can be installed for almost any type of IoT application, while providing several interfaces for connecting to development boards and devices. Rule engine criteria and subsequent actions can be processed locally for you to create a small-scale/private IoT application with minimal costs. The QBoat Sunny can also reduce bandwidth and cloud processing costs of large scale/public IoT solutions by using it as a fog computing server/gateway to filter and relay data to public clouds. The QBoat Sunny is powered by a 1.7 GHz Annapurna Labs AL-314 Quad-Core processor with 2GB RAM and comes with multiple expansion slots and interfaces to satisfy all your IoT development needs. The QTS Lite operating system also provides all the functionality needed for your IoT environments. QTS Lite is a streamlined and thin version of QNAP's QTS operating system. QTS Lite provides Container Station to run containerized applications, myQNAPcloud for remote connectivity, Hybrid Backup Sync for backup and synchronization needs, and Network & Virtual Switch for managing network connections and linking containers, networks, and the QBoat Sunny. QTS Lite also features App Center for adding more features and functionality. If you have already set up an IoT environment, it can be migrated to the QBoat Sunny with container virtualization. Container Station is compatible with Docker and LXC containers and allows you to seamlessly transfer your existing applications to the QBoat Sunny and to further enhance and expand your IoT environment. QIoT Suite Lite integrates multiple easy-to-use and useful applications for you to quickly build an IoT environment. Versatile protocols (such as MQTT(S), HTTP(S) and CoAP) and dashboards are available for you to integrate development boards and sensors to build a complete IoT ecosystem. If you're new to the immerse IoT domain, the QIoT Suite Lite will be an excellent choice.